Do you experience challenges with the process of window cleaning around your property? Your struggles are not enough to remove stains, water streaks and dust build-ups from glass surfaces? 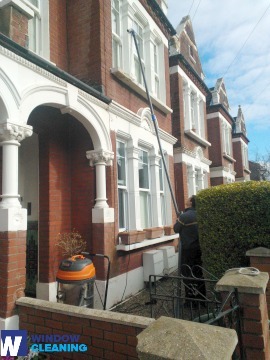 The experts of window cleaning in Stepney will render you assistance! Say bye-bye to the endless hours of polishing and wiping – the skilled and experienced team will handle this problem. You will be able to enjoy your free time – just let us do this time-consuming and exhausting task for you. Our professional approach will grant you lots of perks. We also provide our professional services in nearby areas: Limehouse, Haggerston, Mile End, Ratcliff, Whitechapel. We use progressive techniques of window cleaning to guarantee you will have superb end results. With the water fed pole system, jet washing and rope access equipment, you can be sure that your property's windows will be crystal clear. Besides that, your property is in good hands – the cleaners are completely insured and comprehensively trained. Our water fed poles are connected to water supply tanks, while our rope access pledges for safety – even when we clean skyscraper-sized buildings. You can profit from these options today – dial 020 3746 3113! The experts have the skills and the necessary equipment to provide you with both private and commercial window cleaning. You can count on us for every type of glass surface cleaning. For example, we can wash small or double windows, sash ones, French doors, patio doors and bay windows. Moreover, if you have garden glass surfaces, greenhouse or roof windows, we can clean them too. We use the most progressive techniques and the latest equipment for all the aforementioned window types. We guarantee that the windows of your office will be clean and sparkling, like newly-purchased. Get that by just requesting our commercial window cleaning. For windows up to the fourth floor, we use water fed extension pole equipment which is totally safe and reliable. London is famous for it's tall buildings. So when it comes to those high-rised windows we will bring our rope access squad. With this advanced way of cleaning, we can give you end results like no other! Take advantage of our home window cleaning in Stepney – we provide top-notch services for your home on attractive prices. We use purified water to clean the windows completely. We stay safely on the ground and clean with water-fed pole method. Find us now - ring 020 3746 3113 or just use our booking form. Our staff will help you request a window cleaner and answer your questions. You will love the end-results of our residential services, we assure you to that!